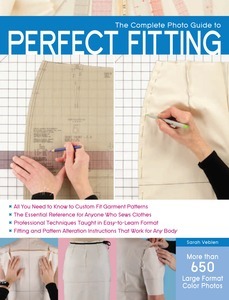 Here is the ultimate reference for fitting test garments and transferring accurate adjustments to patterns! No matter what size or shape you are, wearing garments that fit perfectly makes you look and feel better. Rather than making commonly accepted changes to a commercial pattern, the method presented in this guide focuses on the way a test garment fits the body. The fabric is manipulated to improve the fit, and then those specific changes are made to the pattern. The result: patterns that fit perfectly! See the fitting process from start to finish on basic garments, fitted on real people. Then follow fitting solutions on different body types. The lessons you learn will help you fit any body.